Such a strong spirit truly deserves an attention, and in the aftermath, it was worth it. I came to discover the Luxembourgian Metallers, LOST IN PAIN, through their vocalist / guitarist, Hugo Centeno. Pretty nice guy I have to say, which had me impressed by his dedication and care for his band. After our small conversation, I remembered that I actually had recollections of the band back in the beginning of the decade, I think it was when they released their debut album, total underground newcomers. Since then, a lot has happened for young ones and recently, I was treated to take a listen to their new, and third release, “Gold Hunters”. Like I said, a lot has happened since their debut album, which was mainly controlled by the guys’ appreciation for Thrash Metal, especially in the late 80s, early 90s, METALLICA spirit. A kind of old school flavored but modernized produced. Things started to drift on the second album, “Plague Inc.”, having the band slowing down, delivering heaviness, turning their gaze into such aspects that made them slightly sound like METALLICA’s “Load” other than “…And Justice For All”. And here we are with “Gold Hunters”, which showcased an improved level of songwriting, impressively sharing aggression with great power moments, tight playing and a massive wall of sound generated by a quality production. It smells like progress; wouldn’t you say? And without selling themselves short like other acts I have known. With their current prospect, LOST IN PAIN enhanced their MACHINE HEAD styled groove with their utmost respect and influence of later METALLICA, taking various notes of the American juggernaut's latest release as what I had in mind as a totem. The twin guitar melodies portraying a little British guidance and the eclectic rhythm section made it happen for me, and yes also Mr. Centeno’s Hetfield styled vocals, which I have to say, it is no mimicking guys, this is the guy’s voice. Wisely chosen to be their lead single, and video, I was firstly introduced to “Gold Hunters”. Admittedly at first, I was drawn to its mellow chorus, yet its overall music and conveyed story, left a really strong mark. “Burnout” on the other hand, went on the offensive, descending with mid-tempo toughness and crudeness, however, as it sharpens the blade its uplifting fury, it also harbors harmony that is a keeper. “The Great Illusion” is a generation of stellar musicianship, blasts through a wall like a wrecking ball and piercing the skin like a nail gun. Talk about pure violence to the side of melodic affirmation. Generally, I enjoyed this record. Certainly not your average modern Thrash Metal stuff, yet a little bit provocative. 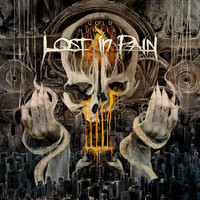 LOST IN PAIN have what it takes to reach into the shores of the bigger league, all is left for me now is to see them live somewhere or watch a good quality live YouTube video. Anyway, I will be looking forward for the next record.